This article contains List of best free XPS viewer software for Windows. XPS file is a document saved in XML Paper Specification or in .XPS file format. It is an alternative to PDF format. You can use this format to save, share, digitally sign, view, and protect contents of documents. It is just like an electronic sheet whose contents cannot be edited or changed after saving. You can only open this file in a XPS reader. Windows 7, 8, 10, and Vista have inbuilt XPS document viewer. This viewer can easily open your XPS documents with double click. You can only read, sign, print, search text, add digital signature, and apply permission in this inbuilt viewer. Although Windows provides you inbuilt XPS viewer, some other free software to open XPS document are also available. These have some more and interesting features, such as: open, read, annotate, share, highlight, etc. This article will introduce you to a collection of such software, which can open XPS files on your PC. You will also get to know how to open XPS file with these XPS reader. You will also learn how these are different from the default XPS file viewer. There are some software which let you read XPS documents, but actually these are a converter or editor. Some software have various annotation tools to enhance your reading experience, like you can highlight, add notes, extract text, extract images, etc. So, if you want to view XPS files or documents with some advanced options, then read out this article and pick any of these XPS viewer software as per your choice. I like XPS Viewer software the most. This XPS file reader is specially designed for XPS files. It lets you read XPS document and provides a 3D interface to do so. You can use Flip book mode in which you can change pages as 3D animated action. You can use this software on your Desktop, Mobile, and Tablet. You can also check out the list of best free PDF Reader Software, CBR Reader Software, and eBook Reader Software. Free XPS Viewer is a free and simple XPS file reader software. It also has option to open recently viewed files. You have to click on Open icon to select any XPS document and read it in two types of interface: Scroll View and Flip Book. Scroll View lets you read XPS document by simply scrolling pages with options to search text from XPS document, zoom, back, forward, and print options. Flip Book View lets you experience 3D page flips like you are reading an actual book, with Print, conversion, back, and forward options. Conversion option lets you convert XPS to other format, such as: XPS to PDF, XPS to BMP, XPS to GIF, XPS to JPEG, XPS to PNG, XPS to TIFF, and XPS to WMP. You can convert all pages together, convert current page, or any range of page numbers. Note: Free version converts only first page of the document. Paid software lets you convert freely. XPS Annotator is a free XPS file viewer. It opens an XPS file through File>Open. You can view single page at a time, two pages, or thumbnails of all pages. Search option is available at bottom. This XPS reader is actually a software to annotate XPS documents, but lets you read XPS file pretty easily. A set of editing commands is available (key shortcuts), which lets you Align the document, correct spelling errors, change font size, delete words, and navigate through the XML file. You can also save your XML document as image i.e. it lets you convert XPS to PNG. It converts each of the page to PNG format and saves all of them separately. Document properties, like: Creator, Identifier, Title, Subject, Keyword, Language, etc. can be viewed as well. Sumatra PDF is another free XPS document viewer. It lets you open multiple XPS files at a time. You can open as many XPS or other documents of supported formats as you want. Open multiple XPS files one by one through File>Open or Open icon. Multiple documents will open in separate tabs. Bookmark panel displays contents, chapters, and topics. Percentage based Zoom in zoom out options are available. Navigate to first page, last page, next page, previous page, and any of the pages by page number. View document properties: Title, Size, File location, Total number of pages, etc. MuPDF is a free XPS file reader. It is one of the simplest freeware to read XPS document. Simply browse and open an XPS file that you want to view. Scroll your mouse to navigate and read the document. It contains a set of hot keys, which can be viewed in the About MuPDF section. You can change background color, use zoom options, use left right alignment options, etc. It supports various formats, such as: PDF, CBZ, ePub, ZIP, PNG, JPEG, TIFF, etc. Read XPS documents for free with aReader. This software opens only XPS document through Open Document option. You can read your XPS document in a single page view, two pages view, or as thumbnails. Search option lets you find any text. Navigation option to help you navigate to first page, last page, next page, previous page, and any page by page number. Zoom options helps you to read clearly, etc. Highlight text with different colors. Add notes using text and ink. Switch between single page view, double page view, and thumbnails view. Navigate to next page, previous page, last page. Find out any text from document using the search tool. A list of Hot Keys is available which displays shortcut keys for annotation, editing, and various tools. Note: Danet Studio is actually a bundled software which has following free and paid tools: Danet Creator, Danet viewer, Danet Reader, Danet Player, Danet Editor, Danet Merger, and Danet Puzzle. To read an XPS file you have to select and launch Danet Viewer. STDU Viewer is another freeware to open XPS files. It also lets you open multiple XPS files at a time. Go to File>Open or click on Open icon, which lets you choose XPS documents to open. You can select multiple documents to open all at a time. All documents will open in separate tabs. Navigate through the documents by clicking on their respective tabs. Export document to Text and Image in PNG format. Different Page layout, Page Rotation, and Zooming options are available. Documents properties, like: Name, Location, Size, Author, Subject, etc. can be viewed for each document. It supports various formats other than XPS document, such as: Djvu, PDF, TIFF, JBIG2, FB2, TXT, Comic Book Archive, PalmDoc, Mobi, AZW, Epub, TXT, TCR, PNG, JPEG, PSD, EMF, etc. Navigate to any page, first page, last page, next page, and previous page. Open Freely lets you open and view XPS files on Windows. It incorporates some tools to enhance your reading experience. Find text from the open XPS document, use Zoom in Zoom out to read document clearly, edit your document with Hex Editor, etc. You can use arrows to navigate to First page and last page, but you have to use your mouse’s scroll to navigate to next and previous page while reading. Various page view modes let you switch between different page layouts, such as: Single page layout, two page layout, and thumbnails. This XPS reader supports many other formats including audio, video, image, Microsoft office, Window System, Document, Archive file, Code file formats, such as: MP3, MP4, FLV. 3GP, PNG, BMP, PSD, GIF, DOC, WPS, WPD, PDF, XLS, XLSX, DOCX, CR2, CRW, JPEG, DLL, DPL, JSP, VB, S, JAVA, PHP, etc. 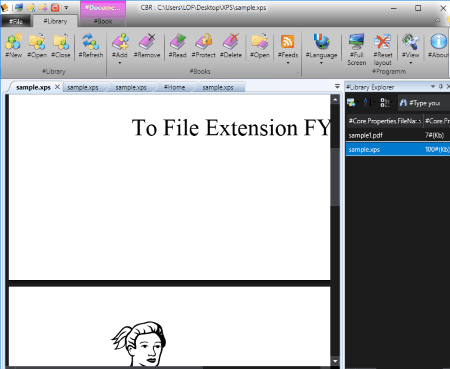 CBR Comic Reader is a free comic reader which can open XPS document as well. It can also open Multiple XPS Files and other files in separate tabs. You just have to open all files one by one. You can read books in different views: single layout, two page layout, etc. Jump to next, previous, last, first and any page by entering page number. You can create and maintain a library of documents, add bookmarks to bookmark bar, and view the recent list. Settings let you adjust limit of recent files, Size of the magnifiers, scaling factors, etc. You can access any device connected to your PC to manage documents. RSS feed option is also available. Master PDF Edit is a free software to open multiple XPS files at a time. You can open a number of XPS and PDF files through File>Open in separate tabs. Here you can edit your documents using text, line, colors, boxes of different shapes and save as PDF document. It lets you highlight any text in different styles, Strikeout text, Underline text, add bookmark, and add comments. Apart from these options, you can use all basic options, like: search, zoom, view recent files, Bookmark panel, etc. It also can be used to convert XPS to PDF. Note: Free version will add a small watermark to converted files. To save a file without watermarks, you have to register. XPS Viewer is a freeware to read file with .XPS extension. It opens only XPS files and lets you read with some simple tools. Simply browse and open XPS files from your PC or open recently viewed files. You cannot change pages with mouse scroll; use buttons to go to first page, last page, next page, and previous page. Go to option lets you jump to any page by its number. Bookmark, Find, Zoom, Rotation, Anti-aliasing, etc. options are also available. IE Explorer is a free web browser for Windows, but also opens XPS files. You can open multiple XPS file simultaneously. It doesn’t need any introduction, since it is the default and inbuilt browser for Windows. There are three ways to open XPS files in IE Explorer. Press Ctrl+O, browse, select, and open the file. Go to File>Open, browse and open XPS file. Drag and drop XPS file into IE Explorer. You can open a number of XPS file using these methods. Read them with Find and Zoom options. Free Opener is another freeware to open XPS files. This XPS file reader has almost same options like other simple software to open XPS document. Go to File>Open to select an XPS document from PC. Recent option displays recently opened files. Apart from these, you can make use of Find, zoom, hex editor, document properties, and page navigation options. This software can be used to open other formats also. It supports more than 300 file types. It could be said that it is a combination of Document viewer, Media Player, Music Player, and Image Viewer. It supports a lot of file formats, such as: MP3, MP4, DOC, XLS, WMV, WAV, MID, JPEG, PNG, BMP, GIF, TIFF, FLV, MOV, MPG, etc.